Ed Hodges (upper left) on the beach at Normandy. THE ENGLISH CHANNEL: June 6, 1944: Ed Hodges didn’t have time to be scared. As a matter of fact, he hardly had time to think of the magnitude of what was about to happen to him. For more than a year he and his battalion had trained in the United States and North Africa, received their baptism under fire in Sicily andtrained some more. They knew their mission. They had diligently trained for it since their arrival in England. Everyone knew what was coming. It was a matter of when and where. From that point on, it was all instinct. It was cold and cloudy off the southeastern coast of England at dawn on the morning of June 5, 1944. The harbors around Weymouth, Portsmouth and Southampton were filled with American and British vessels. With more than 4000 ships and boats carrying 180,000 men and covered by 13,000 aircraft, the largestarmada ever assembled began the hundred-mile trip across the English Channel toward the coast of France. Operation Overlord had begun. Since Germany first occupied France in 1940, Hitler’s forces knew that eventually the western Allies would launch a powerful strike across the channel. German strategists believed that the invasion would come at Calais, some twenty one crow fly miles away from the English Coast. After all, invading armies had taken the route many times before across the channel all the while keeping the French coast line in their sights. Allied planners concentrated a feint on Calais, including the creation of the illusion of non existent infantry, armor and artillery units in northern England. Before the infantrymen leading the invasion could land on the coast of Normandy, someone had to clear the beaches of land and sea mines, barbed wire and cris-crossed timbers designed to impede an amphibious landing. The task of clearing the beaches fell upon the 2nd, 6th, and 7th Naval Beach Battalions, who were assigned to Army engineers. Ed Hodges was an Electrician’s Mate Second Class with the 2nd Battalion. His friends call him “Bulldog.” If you know him, you would know why. Born Reese Edwin Hodges, Jr. in Washington County in 1921, was the oldest son of Reese Hodges, Sr. and his wife, CarrieHodges. 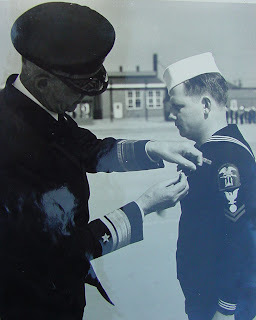 The 2nd Naval Beach Battalion was organized in March 1943 at Camp Bradford, Virginia. After a month of preliminary training, the battalion was shipped off to Camp Allen to prepare for the cross Atlantic voyage to Algeria, where it arrived on April 13, 1943. The sailors were subjected to intense training exercises before shipping out to Tunisia for more training. On July 10, 1943, in a preview of the inevitable amphibious landing in France, the 2nd Battalion participated in the invasion of Sicily, which led to surrender of the Axis country of Italy. Ed Hodges and his fellow sailors returned to Algeria for even more training. In the fall of 1943, the beach battalion was transported to England, where they arrived on the day after Thanksgiving. Their voyage was not a pleasure cruise, as they were constantly harassed by German fighter planes. The beach battalions were primarily organized to act as liaisons between the naval forces and the invading army soldiers. During the invasion of France, the beach battalions would be the first to arrive. Their initial primary goals were to establish and maintain communications between the shore and the navy, guide the passage of men and ships in the area and demolish obstacles along the beach. Once the attack began, the men were to set up aid stations and field hospitals, as well as facilitating the evacuation of casualties. In an interview with Sue Colter of TV-35 on the 50th anniversary of D-Day, Ed Hodges remembered going in about four o’clock that morning, about three hours before the first wave was scheduled to attack on Utah Beach. Hodges recalled that he and his men had to swim some to try and dismantle the firmly placed wooden frames close by the shoreline. “We had metal detectors to find the mines, and we had to dig them out,” said Hodges. There was some hostile fire, “but luckily not much,” Hodges recalled. The 4th Division was coming in full force right behind Ed and his fellow amphibians, known as “frog men.” The German army was stronger than expected at the designated site. The number of mines and obstacles were greater than had been anticipated by Allied planners. In a twist of fate, as if guided by a divine hand, the first wave landed some 1200 yards south of the prime landing zone. The actual landing site was somewhat less fortified, and few mines were found. “After the first wave got in, we had time to rest and the load lightened up,” remarked Hodges. When asked if he was scared, Hodges replied, “Scared? We didn’t have time to be scared. We had a duty to do and had to get it done.” Once the beachhead was established, Hodges and his fellow sailors were assigned to act as keepers of the beach, directing traffic in and out of the area. A raging storm pounded the coast line of Normandy ten days after D-Day. A Landing Craft Tank was approaching the shore when it suddenly struck a mine and split in two. With all of the bravery and tenacity of a bulldog, Electrician’s Mate Hodges sprang into action. He could see the sheer panic overwhelming the dazed infantrymen. Ed, only 22 years old, abandoned his landing craft and began to guide the wounded men to safety. He helped five wounded men from the stern section and sixteen men from the bow to safety. 12th Fleet Commander Harold Stark awarded Ed a commendation for “ devotion to duty, seamanship and outstanding personal courage and skill in assisting the removal of the men under extremely hazardous conditions. Following his discharge from the Navy, Ed returned home to Dublin. In 1948, he married his sweetheart Ann Prescott. Ed and Ann built a home in the post war suburbs at the eastern end of his grandfather’s farm, which once stretched from Lancaster Street to Bud’s Branch along the northern side of Veteran’s Boulevard. Ed and Ann worked several decades for the Veteran’s Hospital before their retirement. Just what possesses someone to take a pole in their hand, run as fast as they can, plant the pole and vault themselves more than a dozen feet up into the air and then land on a pad without seriously afflicting pain upon their bones, muscles or tendons. For one former Dublin High School athlete, pole vaulting seemed to be the natural thing to do. Ira Welborn, a former state and national champion, has been pole vaulting for more than a half century. Today at 62, he still remains active as a vaulting coach and as a weekend warrior, still seeking to make the perfect jump. 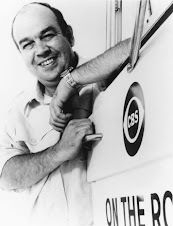 Ira Welborn was born in Dublin just as our country was about to enter World War II. As a kid living on Washington Street, Ira would often wander over to the neighborhood creek. His first poles were limbs which he used to vault over the creek. He looked up to the Olympic vaulters, who fostered his interest in the sport of pole vaulting. Ira’s mother, Mary Turner Barfield, came to Dublin to live with her father, Wiley Turner, who worked at the plywood mill down by the river. Ira didn’t come from a wealthy family. “It seems like I delivered half of the papers in Dublin every morning and I had a route in the afternoon too,” said Welborn. Later his family moved to Woodland Avenue near Dublin High School. Ira remembered that in the mid 1950s, Dublin High didn’t have a track field. Runners ran laps around the football field. There was no true facility for pole vaulting, the team didn’t even own a pole except an old 16 pound steel pole that wouldn’t bend. Undaunted and without the use of a regulation pole, Ira vaulted with anything he could find, even bamboo poles cut from the woods. He practiced and practiced. He got pretty good at vaulting, so much so that when no one was looking, he’d get a pole and jump over the 10 foot tall goal posts at Battle Field. “I would have been in trouble if anyone saw me and I would really be in trouble if I hit my chin on the way down,” Ira fondly remembered. Tom Stewart was Ira’s first coach. In his senior season, the track team got a new coach, Earl O’Neal. “Coach O’Neal admitted to me that he knew nothing about pole vaulting, but he took me to all of the big meets and allowed me to compete,” Welborn remarked. All of the hard work and dedication paid off. Following his usual custom of borrowing someone else’s pole, Ira set a Georgia High School record in the 1959 State Track Meet. His vault of 11 feet 10 and one half inches, which was actually closer to 12 feet, stood for many years before being broken when fiberglass poles came into use. 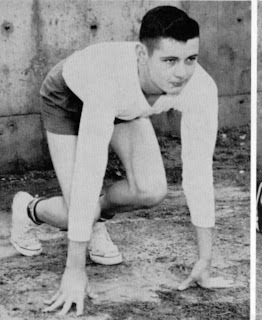 While Ira didn’t participate in any other track and field events, he did play basketball. He played on one of Minton Williams’ basketball teams which went undefeated in its regular season, a year which included a 30 point blowout over the Cochran Royals in Cochran and Cochran’s subsequent forfeit to Dublin. Remarkably in the state playoffs, Dublin drew Cochran, which in the meantime had added a strong player, who appeared to be in his third year as a senior in high school. Cochran slipped by Dublin, only to win the state championship. Ira was offered a track scholarship to Southern Miss, but the school decided to drop track and field before he got a chance to participate. He played around during his college years jumping in an unofficial capacity, but got out of the sport to teach. He taught for ten years, without vaulting much at all. It was during this time when the fiberglass poles came into popularity and changed the sport forever. In those days good poles were (and still are) expensive for the average vaulter. Ira left the sport soon after he got married. Like most of us, Ira gained weight after high school. As he approached the age of thirty, he got into body building. Knowing that in order to get back to the sport he dearly loved, he would have to shave nearly twenty percent of his body weight. He trained hard and long and dropped forty pounds in six weeks to drop to a nearly ideal weight of 180 pounds. In 1973, Ira competed in the annual track meet in his second hometown in Jacksonville, Florida. At the age of 32, he set and still holds the city record with a jump of 14 feet 10 inches. In 1976, he traveled out to Oregon for the Masters National Championship. Competing with the best of the best vaulters in the country, Ira won the competition and set a national record for a vault for a person over the age of thirty with a jump of 14 feet 6 inches. Ira continued to work out and train. He built a pole vaulting facility in his back yard. To this day and about once a month he and two buddies, one from Fitzgerald and the other from Apopca, Florida meet and try to set records for vaulters over the age of sixty. Once a year, Ira hosts a 4th of July vaulting party, where his friends and former students gather together for an evening of food, drink and vaulting. At the age of fifty six, Ira traveled to Maine to compete in the Masters Championship. Ira managed to win the national event with a remarkable jump of 10 feet 6 inches, considering that fact that he was in his mid 50s and that at times the wind was blowing at speeds approaching 45 mph. Ira is still teaching pole vaulting and putting on clinics. He regrets the sport is beginning to wane because of the high liabilities involved. Welborn has observed that actually young girls and women are helping to save the sport. He sees a lot of fathers who are supporting their daughters in the sport, which seems to derive a lot of its new participants from former gymnasts. His greatest reward comes from seeing his students achieving their personal best marks and winning competitions. He enjoys working with novice jumpers and molding them into champions. You’ll find Ira out in his back yard jumping twice a week, still looking for the elusive perfect jump. Welborn compares vaulting to golf, “you practice and practice and never make the perfect jump.” In the meantime, he keeps in shape maintaining his high school physique, but trying to avoid a career ending injury. He plans to jump until he is seventy five years old. You know what, I think he’ll do it, and I wouldn’t bet you any money that he can still jump over the goal posts at the old Battle Field. Too many people think that Shriners put on funny clothes, get in go-carts and parade around on Saturday afternoons. Yes, they are committed to having fun, but their mission is much more profound. The Shriners seek to foster self improvement through leadership, education and community involvement, while their ultimate goal is to serve mankind and in particular, through their operation of Shriner’s hospitals, burned and crippled children. This is the story of two former Laurens County men, who have dedicated most of their adult lives to those goals and in the process rose to the pinnacle of the Shrine of North America. As a high school student, Lewis worked in a small neighborhood sheet metal shop. By the age of nineteen, he owned a small shop. A few years later, Lewis merged with another shop and eventually owned that shop as well. As he began to succeed in business, Lewis became interested in politics. He sought political office because he believed that the business community needed support from state government. At the age of twenty-nine in 1966, he was elected to the Florida House of Representatives. After four years in the House, Lewis decided to run for a seat in the Florida Senate. He served in the Florida Senate until 1978. In 1976, he was elected to a two-year term as President of the Florida Senate. It was during his term as President that the State of Florida completed a new capitol building. While he was the last Senate President to preside in the old building and first Senate President to preside in the new building, Charles said “ Lewis never forgot where he came from selling boiled peanuts and shining shoes on the streets of Dublin, Georgia.” While in office, Lewis worked hard to promote the construction industry and small businesses throughout the state. He served as Chairman of the Committee on Commerce and the Senate Rules Committee. Always active in industry organizations, Lewis served as president of the Jacksonville and Florida Roofing and Sheet Metal Associations. He served as Vice-President of the Florida Council of the Boy Scouts. As a Rotarian, Lewis served as a director of the Jacksonville Club and a Paul Harris Fellow. He was the founding chairman of the Jacksonville Economic Development Council and a member of the Florida Committee for Employer’s Support of the National Guard. In 1991, he sold his two companies, Brantley Sheet Metal Co. and Park & Mick Welding and Machine Works, and concentrated on his residential and commercial properties, as well as farming and cattle ranching. He continued to serve on the board of directors of First Guaranty Bank and Vice Chairman of the Methodist Hospital. All of this he did with the support of his wife Catherine and his five children. Charles inadvertently got into public service. He began working with the Florida Legislature while he was in college. The next thing he knew, he had completed twelve years as an assistant to David Kerns, director of the Florida Legislative Bureau, assistant to Rep. James Sweeny and senior legislative analyst with the Florida House Committee on Transportation. Charles moved over to the executive branch of government in 1981, first as the Assistant Director, then in 1993 as Director of the Florida Motor Vehicle Department. After a twenty-year career with the department, Charles retired in 2000. During his term as director, Charles played a leading role in the automation of titling and registering vehicles within the state. Still wanting to serve the public, Charles accepted an offer to become the President of the Florida Trucking Association, a position which he still holds today. Charles was appointed to the post because of his vast experience in the operation of Florida government as it pertained to transportation issues. “While I did not intend to have a career in government, it was the best thing that ever happened to me,” Charles said. “ I enjoyed my 32 years in government service and it was great for me. I wouldn’t change a thing,” Charles concluded. Lewis, who was everlastingly devoted to his family, joined the Shrine, which allowed him to extend that devotion to many children who needed medical help. Through the Shrine Clubs of North America, Lewis with undying compassion provided children throughout North America with much needed support. A Shrine member since 1960 and a Master Mason since 1959, Lewis spent nearly three decades climbing the various Chairs. In 1987, he was awarded the honorary 33rd degree of Scottish Rite Mason along with Senator Sam Nunn and singer Burl Ives. On July 3, 1997 during the annual Shrine convention held at St. Louis, Missouri, Charles was elected the 109th Imperial Potentate of the Shrine of North America. As the leader of the national organization, which operates 22 hospitals in North America to aid children with orthopedic and burn problems, Lewis felt a great responsibility to do more for the children, funneling every available resource to provide better medical care. Charles was appointed by Lewis as Chaplain of the Shrine of North America. While he is not a minister, Charles is an active member and Deacon of the First Baptist Church of Tallahassee. Charles enjoyed his year as chaplain and sincerely hoped that along with his wife Suzanne, a talented concert pianist, that he was able to positively influence the people they came to know. “It certainly changed my life and helped me to become a better Christian. I will always be grateful to my brother for that appointment,” said Charles. The Brantley brothers are the epitome of public servants. Devoting their lives to serve their fellow man, they have lived their lives according to the long established and universally appreciated principles of the Shrine of North America. Update: Lewis Brantley lost his battle with lung cancer on Tuesday, May 9, 2004.